If you don't fall in love-at-first-sight with the covers of these books by Tassie author/illustrator Jennifer Skelly, you'll have fallen head-over-heels by page one. Not only for the divine illustrations but the for the literary pleasure her work encompasses--from her personal passion for the idiosyncrasies of our incredible English language, to how smitten this animal lover is with the glory of our collective nouns. Who doesn't love a collective noun? And forget about flocks and shoals. I'm talking gulps, squabbles, harems and trips. Bloats, armies, conclaves and rafts. Bound within the pages of these beautifully-produced books, you will find the odd caravan and group, yes, but you--and the kiddles in your life--will absolutely delight in a blessing of narwhals, a riot of kookaburras and an exaltation of larks. Who even knew a group of polar bears was called an aurora or a collection of platypuses and implausibility? 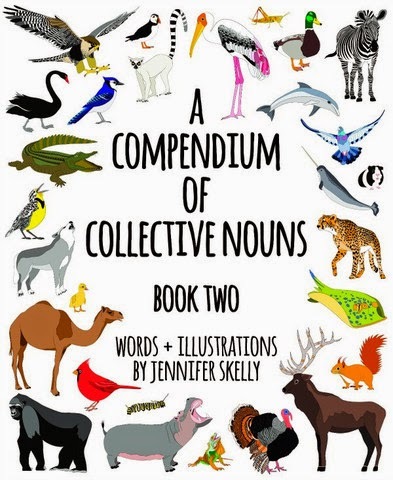 Featuring double page spreads of nouns and the collective critters in question, these hard-bound books have been produced and self-published by Jennifer's company, Red Parka. Beautifully laid-out and designed, they are a prime example of how to self-publish to trade standard. If you are considering self-publishing, you want to get your hands on these books to see how it's done (while simultaneously enjoying the glorious content). 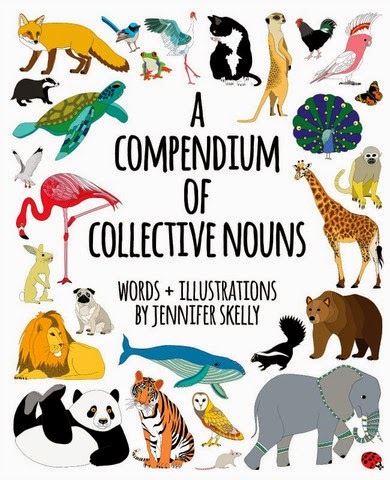 The books include an introduction and information on the history of collective nouns, and can be purchased from Jennifer's site--red-parka.myshopify.com/collections/books. A double whammy of pleasure ... both literary and aesthetic heaven. I'd like to purchase these book. Can I buy them online? They're great aren't they? Looks like you can purchase them via Hachette's website.